Women’s basketball has been guiding Lynn Holzman and Danielle Donehew at every stage of their lives. 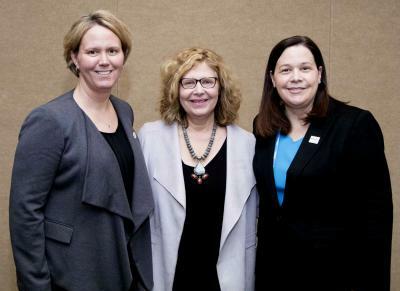 But as Holzman, vice president of NCAA women’s basketball, and Donehew, executive director of the Women’s Basketball Coaches Association (WBCA), spoke on the panel of the first COMMITTED event on March 26, they shared more than just stories of their careers in sport. They drove conversation on the importance of working every day to give back to the game that shaped them. 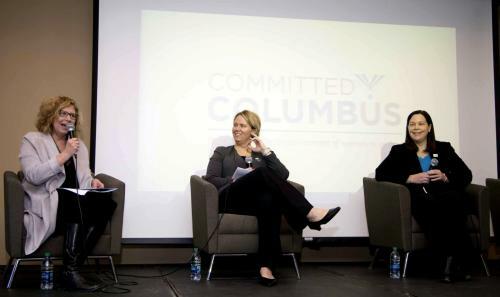 COMMITTED was born from the effects of the Beyond the Baseline professional programming leading up to the 2018 NCAA Women’s Final Four as the Sports Commission identified the large network of female leaders in Columbus. Designed to provide women the opportunity to engage with inspiring professionals and celebrate the power of sport in our community, COMMITTED’s debut ahead of the NCAA Division II Women’s Elite Eight was only fitting. Female professionals from across the city joined the event at Ohio Dominican University as Holzman and Donehew spoke about the state of women’s basketball and how the sport drives their professional lives. For Holzman, a love for sports led her to a career in the government and regulatory area of NCAA and later to her “dream job” as commissioner of the West Coast Conference. But after some reflection and encouragement, she made a leap back to the first sport she loved by becoming the NCAA vice president of women’s basketball. Donehew had a similar start as a collegiate athlete but worked professionally developing the sport as a Director of Basketball Operations at the University of Tennessee, then executive vice president of the WNBA’s Atlanta Dream and eventually an associate commissioner at the Big East Conference. Like Holzman, Donehew returned to women’s basketball when she became executive director of the WBCA in 2014. “The biggest thing about my position is it brings together a lot of the experiences that I’ve had personally and professionally in a way that can serve this sport in a way that it’s served me,” Holzman said. Both panelists emphasized the growing excitement circulating around women’s basketball right now and their partnership in developing a strategic plan to shape the future of the sport at every level. The goal, according to Holzman, is to get people excited in different ways about girls’ and women’s basketball. The passion for bettering women’s sports felt tangible as both women outlined their ambitions and goals for the sport. Donehew called attention to the youth of collegiate women’s basketball, with no NCAA women’s basketball tournament held until 1982, and how investing in the next phase of the sport was so crucial. Following Donehew and Holzman, COMMITTED featured a second panel of former student-athletes at the Division I, II and III levels who spoke on the lessons learned through sports that has carried them through their professional careers. The COMMITTED series will continue to inspire with the next event on May 22 in conjunction with USA Volleyball Open National Championships at the Greater Columbus Convention Center. Join us for a panel with speakers Dr. Cecile Reynaud and Joan Powell, trailblazers and change-makers in the sport of volleyball.